Before considering alternatives to the default Windows uninstaller, you might have a question in mind. Why even use an external uninstaller utility when Windows has its own? If you have ever uninstalled something from your PC, you might have realized a bit later, or perhaps, never that the default uninstaller doesn’t remove everything. This goes especially for the non-MSI uninstallers which almost always leave a lot of files and folders after their removal. Of course, a few files and folders don’t really hurt anyone. But, this can become a big problem over time. Especially for those of us who try a lot of different small and large utilities in Windows. One other thing to also note is that the default Windows uninstaller doesn’t remove all the files that there are. Over time, this will cause you to have small, but significant traces of files that you might never get used, but take up disk space anyway. So this is why you should sometimes use an external uninstallation utility for removing software from your computer. Some uninstallers and other PC optimizer utilities also claim to make your computer faster by cleaning up the registry. You should make sure that you always avoid doing such thing on your PC. The reason why I’m saying this is because the registry entries are very very tiny. Windows has tens of thousands of them even when it is fresh out of the box. Removing the extra ones made by the programs you installed doesn’t affect the performance and certainly doesn’t impact the amount of space taken on your storage disk. If you have ever felt your PC getting faster after cleaning the registry, be assured that it’s just a placebo. At worst, regularly doing such a thing will make your Windows installation less stable. Let’s get to the meat of the matter with the first one being my favorite, Geek Uninstaller. I think that Geek uninstaller is the newest one among all the items in this list, and it is getting traction very fast. Just a few years back, if you asked anyone for an uninstaller, they’d have recommended you something else, however, Geek uninstaller is becoming everyone’s favorite. Pros: Very minimal and unbloated utility for the people who want the business. There are no extra ads, features, and especially malware which can hinder your computer. 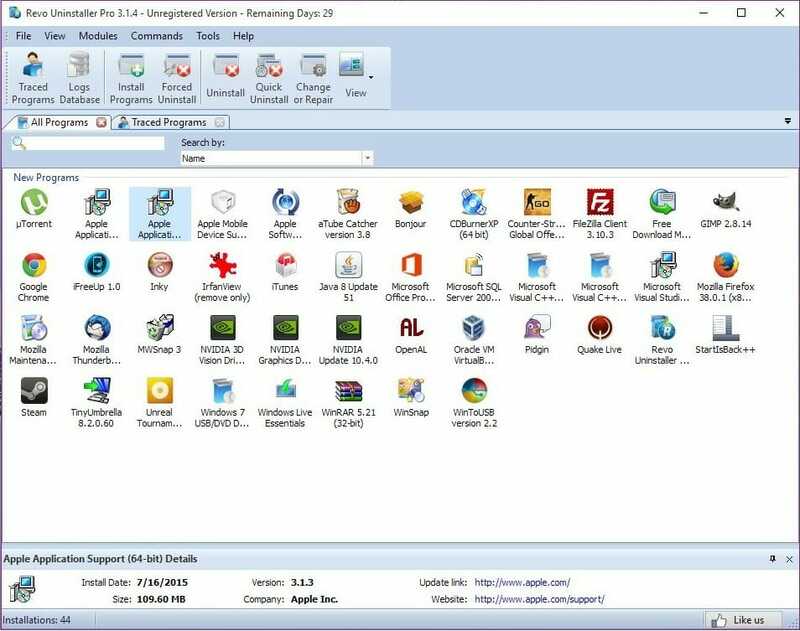 Revo uninstaller isn’t a small name among the uninstaller utilities. In fact, it might just be the biggest one and that is why I am listing it first. 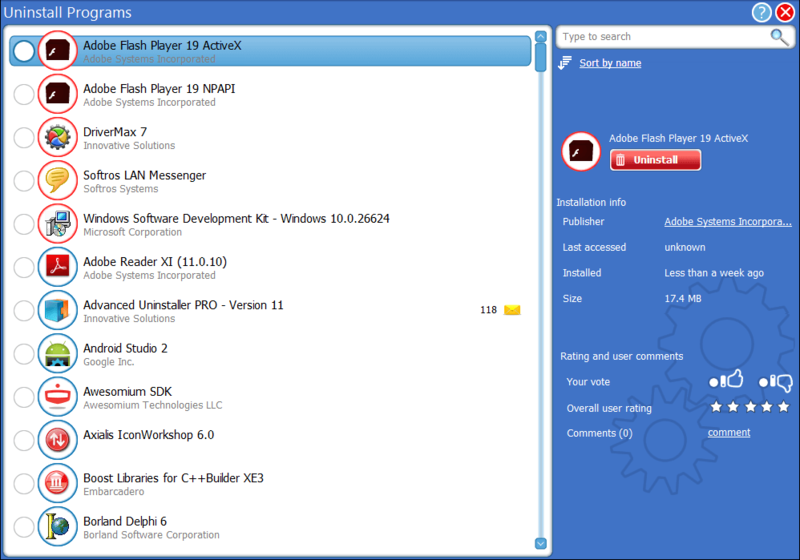 At $19.62, Revo uninstaller is quite cheap, with lots and lots of options. The main ones that I like are the ability to find the installation location and listing the registry key for that particular item in the registry editor. Pros: It provides a lot of options while removing external software in comparison to the default Control panel. There are three levels of removal. The basic, medium and full. The basic will simply remove the files present in the software directory. Medium will remove extra files created by that software and the full will try to remove all the files that can be possibly removed. Of course, the more thorough the removal process you use, the riskier it will be for the stability of your system. Cons: The biggest con for Revo uninstaller is that there is no option to remove x64-bit apps on the free version. They moved that it into their paid version last year or so. And considering the fact that I almost exclusively use 64-bit apps and so do most of the people, it’s a major inconvenience. Apart from the uninstaller utility, Revo uninstaller can also provide the option to clean-up the registry, which isn’t something you’d ever want to do. Doing so can lead to an unstable system, loss of data and other major problems. 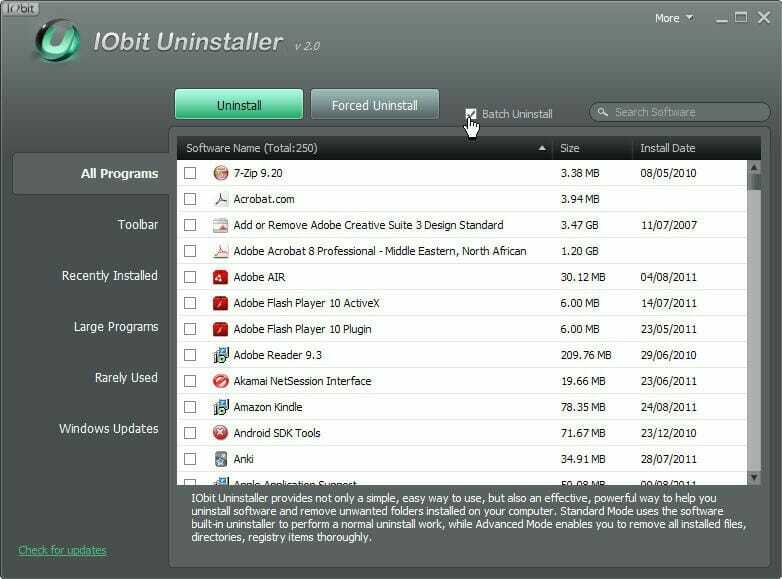 At $22.97, IObit uninstaller is a nice piece of software, without the traditional Windows UI elements. There are options to categorize apps by size, list all the crappy toolbars installed on your system and also the Windows updates that can sometimes break stuff. Pros: The UI is nice. Every program installed on your PC is listed in a category like Toolbars, games, and others. You can also list the programs which you use very rarely or the ones which are very large. Cons: IObit is bundled with an extra thing, some sort of an adware, which aggressively promotes their other products while you are using IObit uninstaller. Some antiviruses and antimalware also prove this by actively reporting it having Win32.Adware.Iobit.A and PUP. While their thing is useful for some, those with no experience on how to detect fake advertisements are better off without IObit. Now, CCleaner is not just an uninstaller, per say, but it is still one of the most popular among the ones listed. And, I must admit that for quite a few years of my infant years with PC, I was a devout admirer of CCleaner. Whenever my PC showed some sort of slowdown, even if it were very little, I’d fire CCleaner almost always. Mind you that this was the pre-SSD era where all the crap on your C drive could actually make your PC slow. Pros: At $ 24.95, it not very expensive, especially if you have to deal with a lot of PCs around you. The best thing about CCleaner is that it is a 12-year-old software, which means that almost every issue that you might ever face with it might be documented somewhere. The Piriform Community Forums are especially useful for the users of free and paid versions of CCleaner. 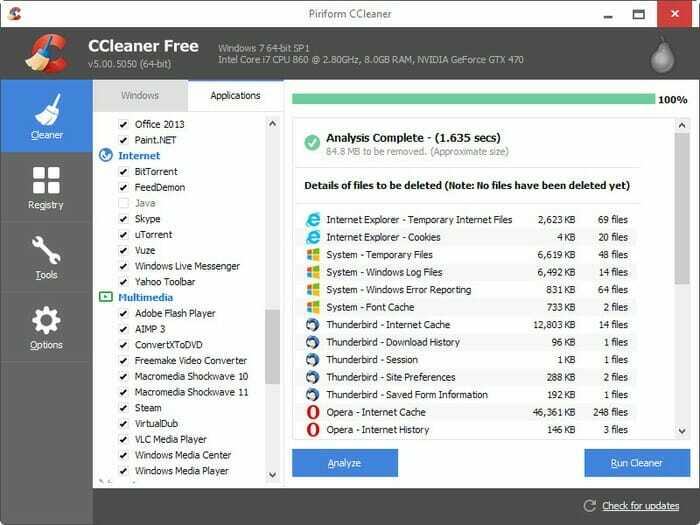 One more pro for the CCleaner is its one-click cleaning function which can help you deal with messy Windows installations in a few seconds. Cons: It is a lot more bloated in comparison to others in this list. This means that you will have to deal with extra unnecessary options that you don’t even care about. In addition to that, the CCleaner also provides the option of clearing up the registry, a kind of snake oil which I would never endorse. Another thing to note is that even the newest version of the CCleaner is not very safe to use with Windows 10. This is because it breaks a lot of file extension associations, removes system files and the filter options don’t work correctly. 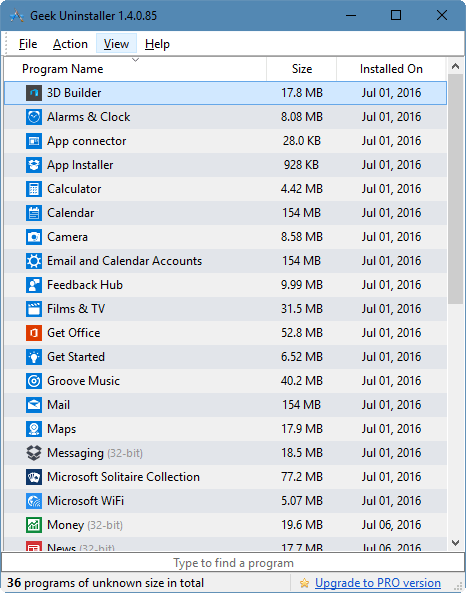 At $30.40, the Advanced uninstaller pro is probably the most expensive uninstaller solution for Windows on this list. But of course, this means that the Advanced installer pro comes with a lot of extra features which can be useful for some people. It also shows you the startup location, publisher name and the user rating for the software that you have installed. Pros: Nice UI with some extra usable utilities that might come handy for some people. Especially file shredder and the live file compression. You can also scan your computer for duplicate files which is an essential one for me. There is also an option to batch uninstall programs which you would like to remove. Cons: This one too comes with registry cleaner and optimizer which I have discussed is nothing but snake oil. One-click removal button beside each of the entries in the software list is a can sometimes cause you to uninstall something you might not want to remove.